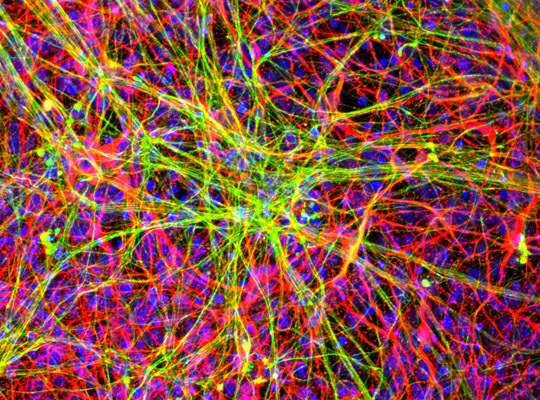 then ultimately the healthy, donor-specific motor neurons shown here. Although only 10 percent of amyotrophic lateral sclerosis (ALS) cases are hereditary, a significant number of them are caused by mutations that affect proteins that bind RNA, a type of genetic material. University of California San Diego School of Medicine researchers studied several ALS cases with a mutation in a RNA-binding protein known as hnRNP A2/B1. In the study, published October 20 by Neuron, they describe how damage to this protein contributes to ALS by scrambling crucial cellular messaging systems. ALS, also known as Lou Gehrig’s disease, is a devastating neurological condition affecting more than 20,000 Americans. The disease greatly diminishes patients’ quality of life and is terminal. ALS affects a special kind of nerve cell called a motor neuron. These motor neurons enable us to move our bodies. Currently, there are no effective treatments for ALS, largely due to poor understanding of how the disease initiates and progresses at the molecular level.